Internet users are more worried than they were in the past about the amount of information that is available about them online. Half (50%) of internet users say they are worried, up from 33% who said that in September 2009. In late 2006, the figure stood at 40%. There is consistent evidence that the level of concern is growing. It has increased among all groups, and is especially pronounced among internet users ages 65 and older and those living in households earning less than $30,000. 66% of internet users said a photo of them was available online. 50% said their birth date was available online. 46% said their email address was available online. 44% said their employer or the company they worked for was available online. 38% said things they’d written that have their name on it was available online. 30% said their home address was available online. 29% said the groups and organizations they belong to was available online. 24% said their cell phone number was available online. 21% said a video of them was available online. 21% said their home phone number was available online. 20% said their political party or affiliation was available online. 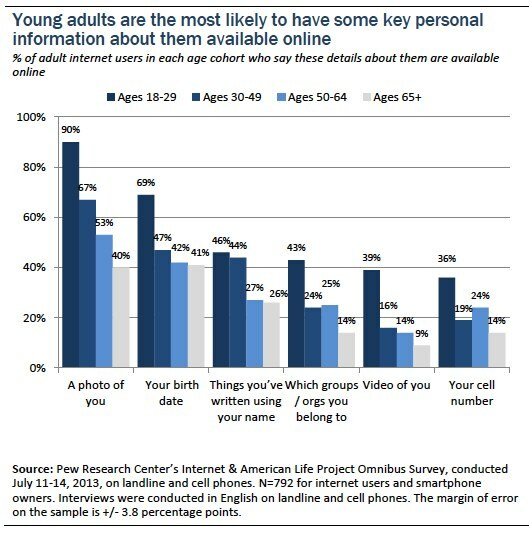 In several of the categories of personal information, young adults are more likely to have those details online, as the chart below shows. Still, there several items on the list where this cohort did not stand out. When it comes to whether users’ email addresses are available online, there were no major noteworthy differences among those below the age of 65. Moreover, young adults were the least likely online adults to say that their home address was available online: More than a third of the internet users ages 30 and older said their home address was online, but only 15% of those ages 18-29 said that. Similarly, these young adults were the least likely to say their home phone number was on the internet – perhaps because this age group is among the least likely to have a landline telephone number. Finally, younger adults were no more or less likely than their elders to say that their political affiliations were available online. It is important to note that significant numbers of respondents said they did not know if some personal information about them was available online. For instance: 30% of internet users said they did not know if their email address was posted online; 22% said they didn’t know if their home address was posted; 17% said they didn’t know if their cell phone was posted; and 13% said they didn’t know if their political party, their writing, and their birth date were posted online. Asked whether they think current privacy laws provide reasonable protections for people’s privacy on their online activities, 66% of all adults said the laws are “not good enough.” Some 24% said they provide reasonable protection. Interestingly, there are not noteworthy differences in answers to this question associated with political or partisan points of view. Tea Party supporters, conservative Republicans, self-described moderates, and liberal Democrats are not statistically significantly different in their answers. Not surprisingly those who say they are worried about the amount of information about them online are more likely to say that current laws are not good enough.